Audio-Technica U.S. has appointed Javier Tiburcio as Training & Sales Support Specialist for the territories of Mexico and Central America. He will be responsible for providing product training and sales support to Audio-Technica distributors and customers in Mexico, Central America and South America. A native of Acapulco, Tiburcio has lived and worked his entire career in Mexico, and will continue to be based there. His previous positions at Hermes Music and Grupo Imis have included sales and marketing responsibilities for the A-T brand in Mexico. 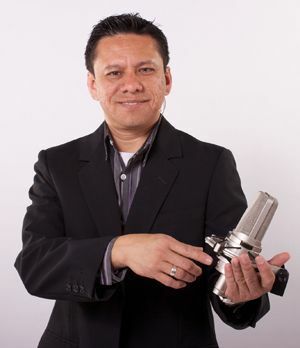 An experienced musician and audio engineer, Tiburcio studied music at the School of SUTUM, and digital audio and audio for broadcasting at CECAT, gaining expertise in microphone placement for live sound and recording. He has visited music industry dealers throughout Mexico and conducted clinics and training seminars at a variety of music expos with musicians like Moderatto Drummer Elohim Corona.